I came across this wonderful verse … written by the celebrated poet … Bulle Shah … these lines seem to bring out the essence of humanity … something which we need to understand, and once we do that, remember … after all, we have all been through a lot … and there are lessons we should have learnt, but dont seem to have … the chapters are fearsome, to say the least! One who had found love, his light is the most powerful! A powerful message … one we cannot, and indeed, for the sake of our future, and that of our children, we must not ignore! There is a conflagration up in Jammu and Kashmir … there was a news piece about the commemoration of the first anniversary of the siege of Lal Masjid. The siege had resulted in armed clashes between security forces, and gunmen operating from the Mosque. Raises a question … a disturbing one. Is this the direction humanity is condemned to walk in? Is this what we shall have as our future? As the world and life we give to our children? It is true … public memory is short … Its been 60 years … more than lifetimes in public memory? True … in large part, we see the event through the mists of time. But, something we need to remember … It was worth millions of human lives … worth uncountable drops of blood, and tears. They called it Partition. And, maybe no other generation can feel the pain of the partition, as much as the children of midnight, the people who lived through it, losing their all … that was perhaps a political necessity … and losing scores of their loved ones. The scariest part … it was not some distant armed force which caused this … that it was ones own people, their friends, neighbours, people they met on a daily basis, the flower vendor, the ice-candy man, who wreaked this havoc. Maybe this is a lesson we should never forget. So we are, at least, not condemned to repeat some of the greatest follies of humanity. Please see these pictures! They tell the entire story of Partition … in a way no words can. I am reading The Indus Sage (i am sure you would know this by now, but for those of us who dont …) these days. So, for the next few days, you can expect more on the subject. One issue the book raises is that Indus (modern day Pakistan, the geography around the Indus river, and its tributaries), and India have always been two distinct civilizations. By and large, i agree with the hypothesis, but there are areas of the argument which Mr. Ahsan raises, which i cant get myself to agree with. First of all, i am not too comfortable with the idea of defining a civilization based on geographical characteristics alone. While historically, we have talked about the Indus Valley civilization, and most ancient civilizations flourished around sources of water, the scenario today doesnt necessarily seem to be the same. The importance of having big cities close to rivers is not as much of importance today as it was in ancient ages. This is not to undermine the importance of water sources, but this is taking into consideration the way human civilization has evolved over the last few millenia. As such, i am more comfortable with defining a civilization culturally rather than based on proximity to geographical characteristics by themselves. This, to my mind, is a definition which tends to be far more robust. This doesnt really tend to go down well with the modern definition of Pakistan, but then a lot of other things dont either. 1. I get the feeling that the entire idea of the Indus civilization is related to Islam. Historically, it may not have been, since the region was primarily Hindu and Buddhist over a period of time, but since the advent of Islam, the identity seems to be more and derived, and even more so since the creation of Pakistan, the identity of Pakistan seems to be have been defined even more based on Islam if Mohajirs are people who reverted to their Indus heritage, even if they find their home and roots in the Gangetic plains. Having said that, i do agree with Mr. Ahsan that Islam is not the defining characteristic of the Indus civilization. More about this in point 3. 2. If the civilization is going to be defined based on geographical characteristics, then the logic holds true, but if it is not, then the entire argument of declaring Kashmir an inseparable part of the Indus civilization loses its entire foundation. For, culturally, Kashimir can in no way found to be congruous to the Punjabi or Sindhi. Besides, if we are to define a civilization based purely on geographical characteristics, then maybe Tibet should also be a part of Indus, since the Indus river originates there. This doesnt stand to reason. 3. None of these considerations (except religion), can define the true nature of Indus, considering East Pakistan being a part of Pakistan. But, this by itself proves that religion is not the founding stone of the Indus of today, given that if it were, the centrifugal force which created Bangladesh would not have existed. In a nutshell, i agree with Mr. Ahsan that the culture and civilization of Indus is distinct from an Indian civilization. I just dont agree with too many of the conclusions he seems to draw from this fact. Firstly, the Gurdaspur Kathiawad line … Mr. Ahsan makes the argument that this is the line which divides two different civilizations. While i do agree that culturally, the Gangetic plain is quite distinct from the Indus civilization, i think the line that Mr. Ahsan has drawn comes more from a sense of current political geography rather than anything more concrete. For instance, this line traces quite well the Radcliffe Award. Is this just a coincidence? Probably not. Which would suggest that the positioning of this divide is more than scholarly debate. Another thing that stands out … the creation of Pakistan. While the civilization of the Indus region is distinct from the larger Indian civilization, the fact remains … the creation of Pakistan was not a civilizational consequence. Nor was it a religious consequence of the deep divide between the Hindu and Muslim populations of the subcontinent. If it was a religious consequence, Mohammad Ali Jinnah wouldnt have declared Pakistan as being a secular state, where the religion a person professes to would not come in the way of how the nation treats him. Which leaves one aspect … the political aspect. This goes to suggest that the creation of Pakistan was purely a political move, and shouldnt be seen as anything else. That this is backed by civilizational differences probably doesnt bear on the debate. Another thing which i dont quite agree with … that the Mohajir is an Indus person reverting to his roots. How does a Mohajir, who may come from Lucknow become an Indus person? How does he lay a claim to the history of Indus, that is larger than that of a Punjabi Hindu, or Sikh, who hails from the Punjab, whose Father might have called Lahore or Rawalpindi home? This argument suggests an Islamic connection to the civilization of Pakistan, which is definitely not the thesis of the book. The festival of Baisakhi is celebrated on the 14th of April … And, this is an occassion to visit the city of the Guru … Amritsar! Add to this the fact that the weekend was a 3 day weekend, we went for a visit to the lovely city. 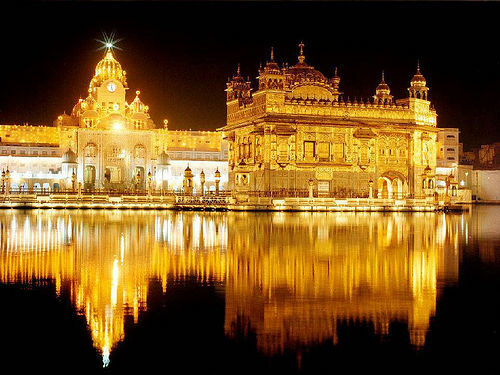 And, believe you me (or, if you dont believe me, see this picture) … The Golden Temple … is a sight to behold. And, a place of Eternal Peace. The waiting in the queue … Mattha tekkna at the Guru’s feet … Something which is an experience of Peace! Something i would like to do again … and again! I have still not told you wh I was feeling nostalgic about the city I had never visited before. The first one … My grandparents got married in this city. Both my grandfather and my grandmother passed on to another life almost 2 years ago … the memories, of course, still remain. And, the city of Amritsar was a living reminder … and, a thought that maybe I should have gone there earlier. Much earlier. Another experience … collecting the Prasad … the smell, the look, and taste … Probably the only time i have ever been to a Gurudwara was with my grandmother. That, too, was as a child. And, then, whatever the Kadha that the Bhai ji gave to my grandmother, only little bits were available to the rest of the family, and the rest was for me. The smell of the Prasad brought back memories … smells of times when, as a child, i would eagerly look forward to going to the Gurudwara with my grandmother on weekends (weekdays, school was too early as it is …), mattha tekna, and then waiting for the Prasad … probably the only reason i went to the Gurudwara. Of course, now i dont think it was the only reason (considering that i would get it even if i didnt go). Which means the reason was more … And, this reason was something which peeped through the mists of time, to show me the thread of memories, the thread which lingers, no matter how time might try to erase it. The thread which reminded me of going to the Gurudwara, and the smell which took me back almost 30 years. Another thought … my friend, Pavan got us a ringside view for the retreat ceremony at Wagha … The ceremony itself is an experience which one must have … but, i am not talking about that. There is a point during the flag-lowering when the flags of India and Pakistan are right next to each other … which gave me the feeling … so near, and yet so far! But, i am not talking about that either. What i am talking about is that sitting at Wagha, we are closer to Lahore than to Amritsar … Lahore … Another city which brings back memories from the mists … Memories not of something i have seen, but more of things i have heard … tales of Lahore. A Lahore where Muslims, Hindus, Sikhs lived together … a city they all called home. A city which was called the Paris of the Orient. A city referred to as “The City of Sin and Splendour” (a collection of stories about Lahore, edited by Bapsi Sidhwa). A city, which lives on in my mind’s eye, a picture etched, albeit dated, but a beautiful pitcure at that. A picture of the Lahore before it became a place out of bounds for lakhs of people who knew no other city other than Lahore. Looking at the road at Wagha … the road leading to Lahore … brought back these memories. Of course, the real Lahore of today may not have much to resemble the memories i carry (memories which i saw through my grandfather’s words), but definitely a city which attracts me. Definitely a city which i would like to see … though, on second thoughts … maybe not? It is better to travel hopefully than to … On other thoughts, a city i should have visited maybe 10 years ago.